"If a book is not worth reading twice, it is not worth reading once." As an adult, the book I think I've revisited the most times is Neil Gaiman & Terry Pratchett's Good Omens. I looked up the publishing date and was surprised to discover it originally hit stores in 1990! At that point in time, I believe I'd read one of Pratchett’s Discworld novels (though I couldn’t get into it). I didn’t discover Gaiman’s work until the summer of 1993 or so, when I was gifted a copy of The Sandman issue 50. I first bought Good Omens sometime in the mid-to-late 90s (probably after reading Neverwhere) and immediately fell in love with it. Since then, I’d guess that I’ve read it 6 or 7 times. I have no idea how many times I’ve lent it out to friends. Miraculously, every read-through and lending has happened with that same original paperback. It has survived 20+ years of loving use with a surprising lack of wear and tear. My most recent re-read of Good Omens was about two years ago. And, for the first time, I didn’t really love the experience. But, also for the first time, I was reading it in fits and starts, a half-hour here and there over lunch, rather than speeding through it in a weekend or evening. I realized that it benefits from a consolidated reading – the humor works so much better when it’s read fast with all the details fresh in your head. Over the years of lending it out, I discovered that my friends’ reactions to it were distinctly hot-and-cold. Some, like me, devoured it and absolutely adored it. Quite a number of others, though, didn’t care for it and didn’t finish it. Now, of course, there is a lot of accounting for taste – particularly when it comes to very British humor and themes that involve biblical mythology and the end times. But I realized there was a strong correlation between enjoyment and reading speed. The friends who were fast, voracious readers plowed through in record time and celebrated it. The slower readers (like my wife, who may take a month or more to read a book) often complained that they just "didn’t get" the humor and tone. They also couldn’t keep track of all the characters and what was going on. What, for me, was a book with a brisk pace and payoffs every page was, for them, a mighty slog. Pacing is always important with any storytelling. But I think this was the first time when I realized how much the reader’s own pace affected the impact of the tale. Still, even though that last drawn-out read left me a little wilted, I know that I will come back to Good Omens again. Just, you know, with a more dedicated window of time to appreciate it in. Alongside that book, some runners-up for most-often-read for me would be Neil Gaiman’s American Gods and the Harry Potter books – in particular Prisoner of Azkaban and Order of the Phoenix. With a busy schedule and so many great novels coming out every month, it's hard to make time to re-read books these days. But a great story is worth going back to again and again! 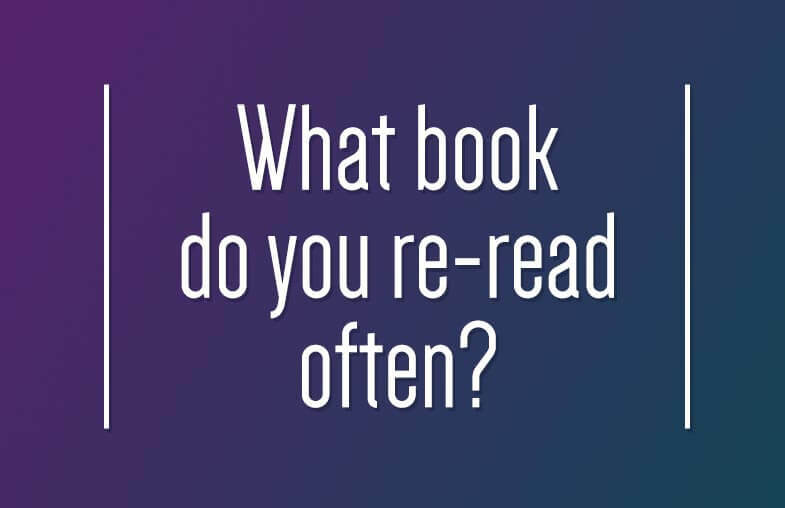 What book or books have you re-read most often? Join in the conversation on Instagram or on Twitter!